Geely Auto has unveiled its flagship new energy sedan at the 2018 Beijing International Auto Show. The Geely Borui GE is the hybrid version of the existing Borui sold in the Chinese market. The Borui, a large D-segment sedan, is Geely’s existing flagship model. There are two variants of the Borui GE – the PHEV plug-in hybrid and MHEV, M for mild. The PHEV powertrain combines a 1.5 litre three-cylinder turbocharged engine and seven-speed dual-clutch automatic transmission. Jointly developed with Volvo, which Geely owns, this powertrain’s fuel consumption is rated at 1.6 litres per 100 km. Geely is proud of the powertrain, which it says surpasses international brands in FC and performance. Volvo’s version is called the T5 Twin Engine, where the engine puts out 180 hp and the electric motor 55 kW. The T5’s total system output is 250 PS and 400 Nm. The DCT used here is Volvo-designed and not the previously employed Ford Powershift (Getrag) unit. More details on the Borui GE’s PHEV unit soon, as we navigate Geely’s packed stand. Besides the PHEV, the Borui GE also gets a new regular (non plug-in) hybrid MHEV variant that uses the same 1.5 litre turbo engine. This 48V mild hybrid employs a battery starter generator (BSG) unit to give it fuel consumption of 5.8 litres per 100 km, which is 15% lower than what the engine alone will do alone. Launched in 2015, the Borui is a D-segment sedan designed by Peter Horbury, the former Volvo designer who is now Geely’s senior VP of design. The three existing petrol engines are a 1.8T, 2.4 NA and 3.5 V6. This debut is part of Geely’s green mission, which is to be China’s leader in new energy vehicles. “China will ultimately become the global centre of a new energy revolution that will reinvent the car as we know it, hence making its automotive industry stronger and more resilient. As a leading Chinese automotive brand, we’ve realised that competition in this new era will come in the form of a technology war and that we must lead through technological innovation to become the vanguard of this new age,” An Conghui, president and CEO of Geely Auto, said at the Borui GE’s unveiling in Beijing. “Geely realised this 12 years ago as we began our foray into the new energy sector by investing heavily in research and development, integrated our global resources, as well as strengthen the strategic collaboration we’ve had with Volvo. We’ve employed about 2,500 brilliant minds globally in new energy engineering to focus on the development of hybrid, pure electric, fuel cell and alternative fuel technologies,” he added. In the Blue Geely Initiative announced in late 2015, the company aims to mass produce new energy vehicles by the year 2020, targeting a 90% sales rate for electrified vehicles. In the masterplan, 35% of the green cars will be full EVs, with the rest made up by hybrids and PHEVs. Design highlights include the Geely signature “expanding cosmos” grille – which represent the company’s expanding universe – and front/rear lamps with 3D graphics inspired by traditional Chinese fans and the twirl of a gymnast’s ribbon. The cabin is rather spectacular. The main event is the Full Vision dashboard that was first previewed on the Emgrand Concept in 2015, now in a production car. Also included in the flagship model are Geely’s recently launched GKUI smart ecosystem and the Energy Hub, which offers wireless charging for mobile devices. The Borui GE PHEV and MHEV will be officially launched in China on May 28. 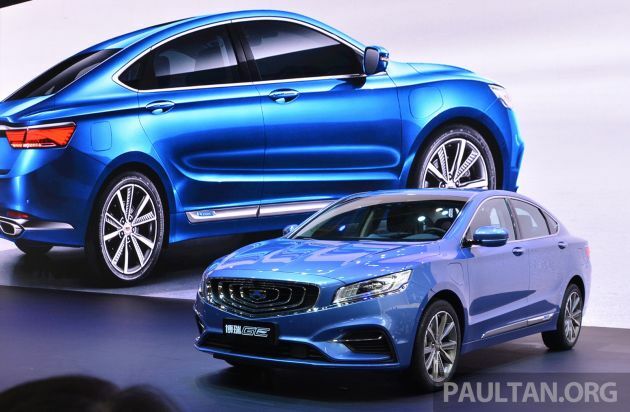 The Geely Borui would be a good base for a next-generation Proton Perdana, no? What do you think? better this than pipu ‘bagai langit n bumi p1 accordana..oo waii! You tak suka accordana, you keluar.. oo waii!! every person who ‘meleleh for accordana like this guy here.. Got No Taste! Bring in this as Perdana.. Proton got hope liao.. Volvo drive train is excellent.. It was hopeless because it was not during under Geely management yet… China can do magic.. In Bolehland…Raya is around the corner after GE 14. Looking at P1 sales,oh..no..it can hardly cross the 30,000 units sales mark by end June. No point talking about bringing this and that left hand drive China Geely model,and conversion to right hand drive. Just Boyue conversion,takes 15 months. Meanwhile,all the drive to increase more 3S centres has DR.Li kepala pusing while the vendor suppliers,. are on mogok modus operandi. Just pathetic,every month Perodua is eating more and more into P1’s rightful market share. WE r looking into a new round of taxfunded bailouts again. Holy smokes, that interior is AMAZING. And the exterior is reminiscent of German styling. And the best part is that this could possibly come to Malaysia in the next few years. Geely Bo Rui cud be the best base for next Proton Perdana to penetrate global RHD markets. Leveraging on Merc expertise in developing RHD and LHD models. Make this as the new Perdana! I don’t know, it looks too “artificial”. I would definitely tone it down a little, make it more aggressive. Also lower it a little bit. Sudah lah. Jangan bukak aib sendiri lagi. Perdana, took 2 years to rebadge, sell 1 year and terus end of production. Somehow, the Full Vision dashboard in this China car is something the slap on flat screen tablet Mercedes-Benz User Experience (MBUX) system can learn from. OMG. This must be a late April fool joke. “Geely Bo Rui” in Hokkian means Geely No Money. On the contrary, Geely has all the money a carmaker can ever want. Volvo, Proton and Daimler can attest to that! Of course the world know Geely have $$$ otherwise how to buy over Volvo. Why name it “Bo Rui” ?? If Geely want to make this into a global car, they should NOT use Bo Rui. Should rename it as Perdana U-Rui(Perdana got money) for M’sian market. China will not give a damn what you Malaysian say. Bo Rui U Rui is your problem. Hahaha. Best Rebuttal/reply I’ve received. U deserved a Thumb Up. The front grill design like macam dulu volvo punya concept car. Designed by the same guy mah. Peter Horbury was in Volvo back then, now he’s leading Geely Design. Wow!! that Full Vision dashboard beats Mercedes’s Ipad dashboard by at least 10 years. better than Tesla square tablet. Looks like a revamped of the 2nd gen Volvo S60. Bring in as next generation Perdana, price under RM120K for the PHEV version, make it the cheapest in the D-segment, sure will sell like hot cakes! We have heard these many times … bla bla bla and it will sell like hot cakes. Until now none of Proton model is selling like hot cake. That is because Proton has not fix 2 biggest problems in the past. QC and service center ‘tidak apa’ attitude. The front grille looks terrible and so is the rear boot lid. Just a suggestion, it would help tremendously to have designers from Europe to go for a more internation outlook. Like what Korean motors are doing. The signature grill needs input from a genius or multiple geniuses. Wow. Bold rear defuser(?or isit) design! B.O.L.D ! mustang vibe but shorter. So are we still pandang this brand sebelah mata? Why ?